The first issue in this volume is a standalone with all the girls sitting around a campfire telling ghost stories, and there were tons of really great guest artists who illustrated the different stories. The rest of the volume follows Mal & Molly as they try to take advantage of their first quiet day at camp to have date – but it takes a strange turn, as things at camp often do. Jo, April, and Ripley attempt to stave off bored by trying to earn as many “normal” badges as they can, but are surprised that its much more difficulty than fighting mythical beasts. The stories in the volume were really fun. I love seeing the relationship develop between Mal and Molly, and Ripley’s attempts to earn badges had me smiling the whole time. The only real downside was the art for the main story arc. Carolyn Nowak’s art is good, but I just prefer Brooke Allen’s style. Its a bit jarring when you have this idea of what the characters look like, and it can be a bit distracting when they’re drawn differently. While this is probably my least favorite volume in this series, its still really great. I love spending time at camp with the girls as they navigate both the mundane and the mythical. 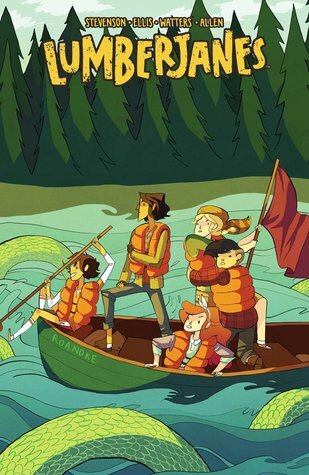 This is my favorite Lumberjanes volume to-date. The story starts when Jen tries to teach the girls basic survival skills. But, in the middle of their lesson, a blizzard strikes camp separating Jen from the girls. Jen is rescued by a mysterious taxidermist which a unknown connection to Rosie. And the girls strike out on their own to try to get her back. They are joined on their quest by a friend from a past arc which leads to some really great discussions about identity and being true to oneself. I love that we get a lot of backstory in this volume, and the direction the story is taking. You can really tell they are starting to play the long game. While we get some answers, we also get more questions which makes me very excited to see where this story is headed. Plus, Brooke Allen is back as the artist in this volume so we get to see the characters looking like themselves again. Overall, this volume was fantastic. The story is well developed, the art is beautiful, and as always their is a wonderful message about identity and acceptance. I cannot recommend this series highly enough. There is so much to love about this volume. The first issue is a flashback to the first day of camp so we get to see Jo and her dads, Ripley’s chaotic family, and Mal’s taxi ride. The rest of the story arc involves a broken friendship and a mermaid band. That’s right – mermaids! The girls are enjoying a relaxing day by the lake when they meet a mermaid whose been kicked out of her band. April decides that she must help mend this friendship, but things don’t go as smoothly as she was expecting. If Brooke Allen had done the art for this volume, it would have easily been a 5 star read for me. And, likely my favorite volume of the series. But, the fact that the characters didn’t look like themselves (especially Jen) was a little off putting. The story itself is super engaging, and I found myself incredibly invested in how it was going to turn out. 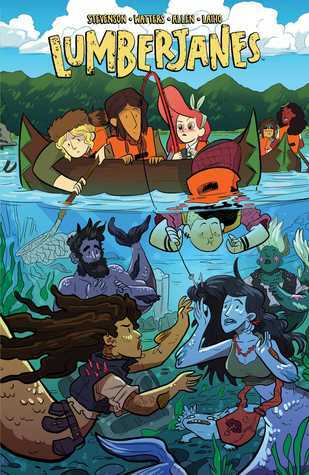 Lumberjanes always manages to have a “moral” without being preachy. It just finds this perfect balance. Overall, this volume a fantastic installment in the series, and I’m eagerly awaiting the publication of Volume 6! 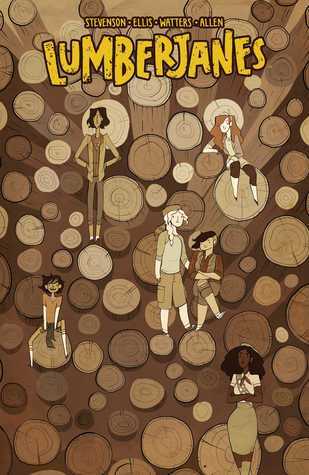 I love the lumberjanes too! I hope you get a chance to pick it up soon! I’ve been wanting to read this for the longest time!! !